Every once in a while I like to flex my cooking muscles by attempting a complex recipe. Something completely from scratch that is a little more difficult that what I normally whip up on a Tuesday night. This usually occurs on special occasions, as was the case last weekend for Valentine’s Day. 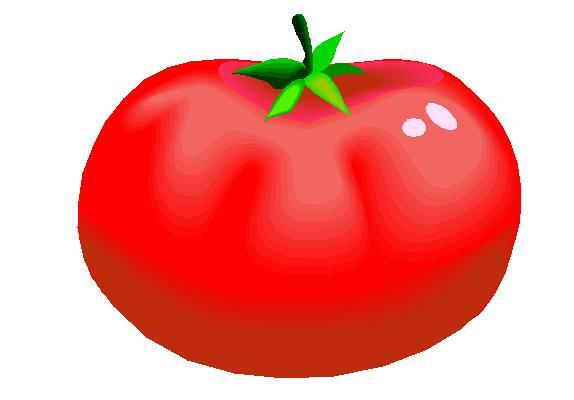 I recently checked out a copy of Veganomicon from the library. I had seen it in the store but wasn’t sure if I wanted to buy it, so I borrowed it from the library so we could spend a little more time getting to know each other. 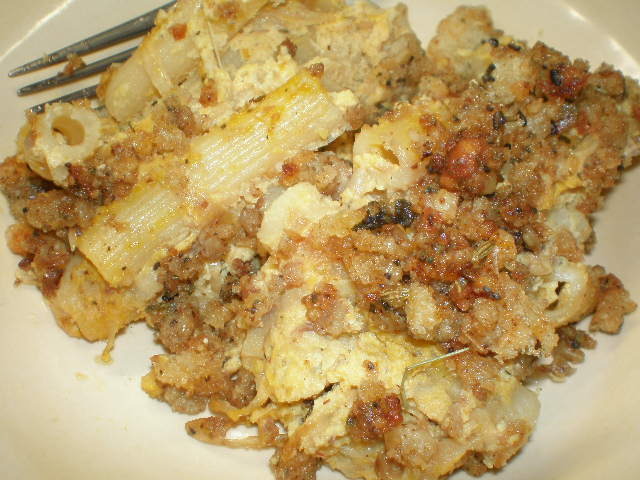 Last Saturday as I was making our meal plan for the following week, flipping through cookbooks, I came across a recipe in Veganomicon called “Pumpkin Baked Ziti with Caramelized Onions and Sage Crumb Topping.” I think that’s the longest recipe title ever. Of course it was the pumpkin that caught my eye. I have professed my love of pumpkin on this blog many times before. This recipe also called for ricotta-style cheese made out of tofu and cashews. What the heck? I had to try it to see how it would taste. A little risky for our big Valentine’s Day dinner, but if it sucked we could always get Chinese take-out. We started our Sunday with double chocolate chip pancakes and then ended with the pumpkin baked ziti. First make the cashew ricotta. 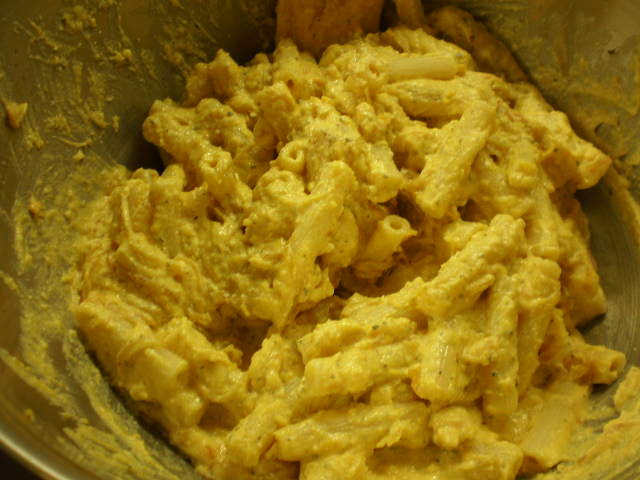 In a food processor, blend together the cashews, lemon juice, olive oil, and garlic until a thick, creamy paste forms. Add the crumbled tofu to the food processor, working in two or more batches if necessary, until the mixture is thick and well blended. Blend in the basil and salt. It really looks like ricotta cheese! 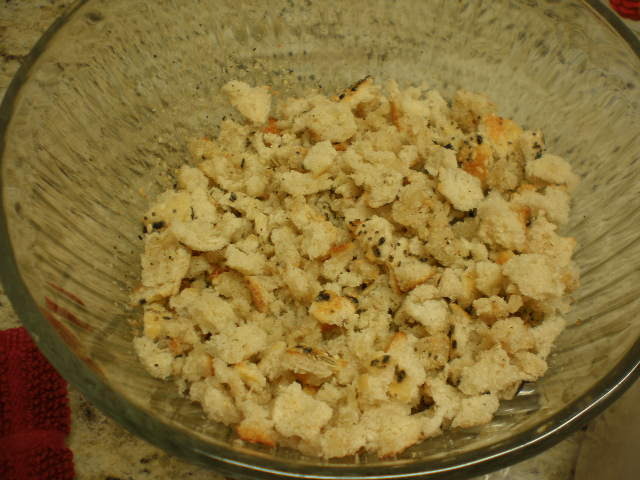 After the ricotta, I made some homemade bread crumbs with a baguette. Once again my baguette wasn’t old enough (like when I made pumpkin french toast) so I toasted a few slices in my toaster oven first, then chucked them into the food processor to get some coarse crumbs. I also accidentally bought a baguette with a bunch of crazy seeds and spices on the top, so there was a little extra pizzaz to my bread crumbs. Next get to work on the pumpkin ziti. Preheat the oven to 375 degrees F. Lightly grease a 9 x 11 inch lasagne-type baking pan with olive oil, or use two smaller pans. Prepare ziti according to package directions, about 10 minutes. Drain, rinse with cold water, and drain again. Set aside. 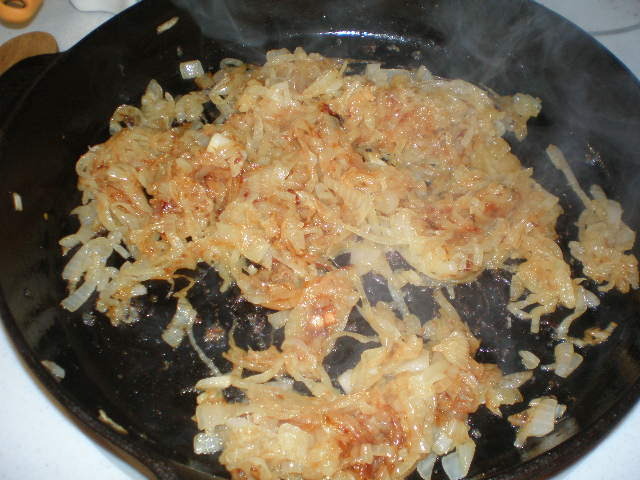 While the pasta is cooking, make the caramelized onions. Preheat a large, heavy-bottomed pan, preferably cast iron, over medium heat. 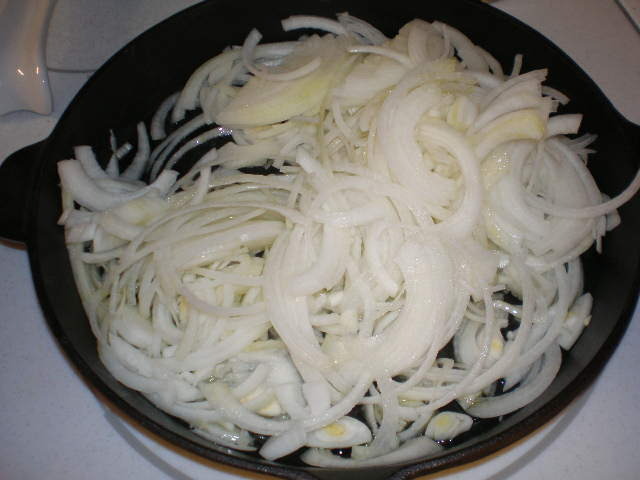 Saute the onions in oil until some onion bits are very brown and caramelized, 12-15 minutes. Set aside. Caramelized! Mine actually took a lot longer than 12-15 minutes. Just keep on sauteing until they get nice and brown. Now place the cashew ricotta in a large bowl and fold in the pumpkin puree, brown sugar, nutmeg, white pepper, cayenne and vegetable broth, and mix. Add the cooked ziti and caramelized onions, stirring to coat the pasta. Pour the mixture into the prepared baking pan and press lightly with a rubber spatula to level it. 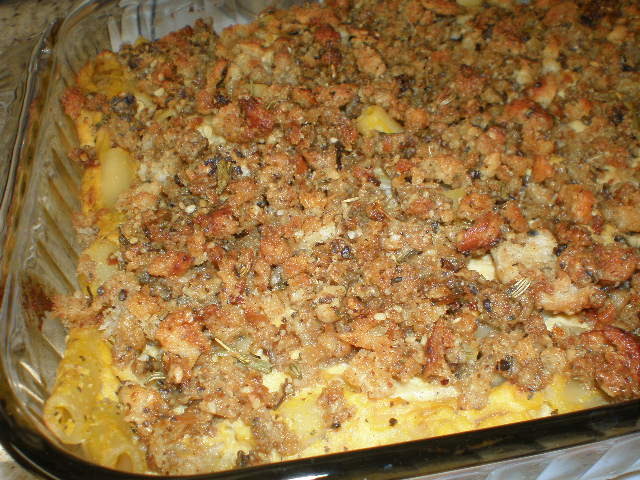 Next make the sage bread crumbs. Melt margarine in a large, heavy-bottomed skillet over medium heat. 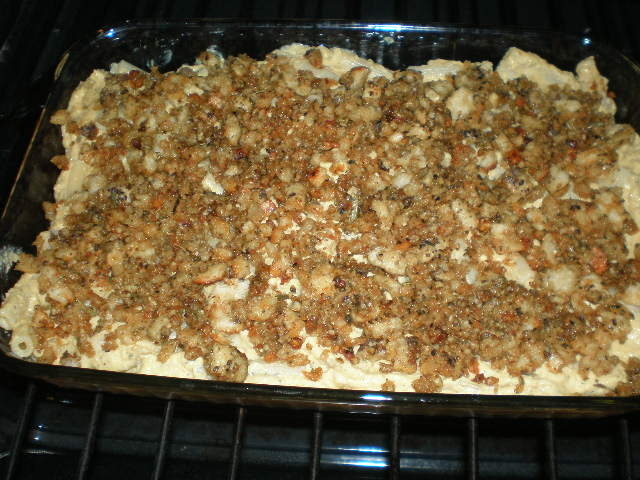 Stir in the bread crumbs, walnuts, dried herbs, and paprika and season with salt and pepper. Stir constantly until the mixture is lightly coated, 3-4 minutes. Remove from heat and sprinkle evenly over the ziti. Bake for 28-30 minutes, until the top of the ziti is golden brown. Cool for 10 minutes before slicing and serving. Finally, it’s all done. Whew. I was seriously worn out by the end of all this cooking. While the ziti was baking Benzo was nice enough to do the dishes while I laid on the couch. The result? Completely and totally delicious. No Chinese take-out needed. And the cashew ricotta? It was so creamy. I never once thought about the fact that it wasn’t actual cheese! All the flavors in this dish were wonderful. We enjoyed the leftovers all week long. As a final note, I’ve really enjoyed flipping through Veganomicon. I think I’m going to add it to my wish list. The recipes seem a little complicated at times, but I’m sure there are some in there that are easier than this one! It seems like it also has a lot of recipes for sauces or mixtures that I might use in other recipes, like the cashew ricotta. I could definitely see myself using that one again in lasagna or another baked pasta dish. If you have Veganomicon, what’s your favorite recipe from the book? I used a pint jar of frozen pumpkin puree from last year’s garden and it was perfect!